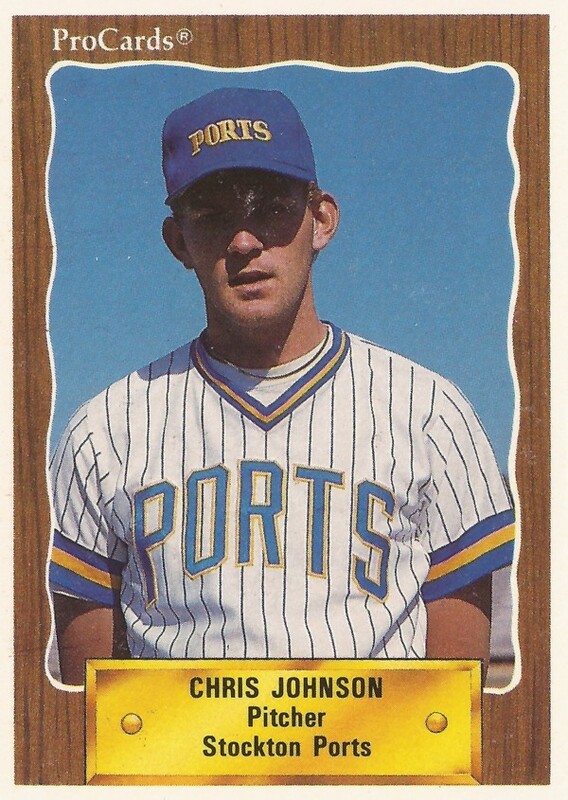 Drafted straight out of high school, Chris Johnson started his professional career thinking he was better than he was, he admitted to The Milwaukee Journal in July 1990. But, in his fourth professional season, Johnson relayed he then had a better perspective. "I couldn't blow past guys like I used to in high school," Johnson told The Journal of his transition from high school to the minors. "I kind of wondered why Milwaukee drafted me, and I'm sure the first couple of years they were wondering the same thing." "They've given me the best opportunity that anybody ever has," Johnson added to The Journal, "and it was just time for me to do something, especially with the way they've been patient with me." Johnson had regained his confidence by that time. Johnson spoke after going 12-2 over the first three months of the season, with a 2.34 ERA. But, while Johnson had his confidence back, he also would never make the majors. Johnson was originally signed by the Brewers in 1987, taken in the second round of the draft straight out of Red Bank High School in Chattanooga, Tenn.
Johnson started his career at rookie league Helena, going 5-0 with a 4.03 ERA. He advanced to single-A Beloit for 1988, keeping a steady ERA at 3.95 with a record of 8-10. For 1989, Johnson stayed at Beloit, improving to a 3.18 ERA and a 9-9 record. For 1990, it was high-A Stockton. His season-long ERA ended at 2.98, with a record of 13-6. That April, Johnson and another pitcher combined for a one-hitter, The Journal wrote. By that September, Stockton manager Chris Bando had high praise for Johnson. "In my mind, he could be pitching AAA ball with the stuff and command he has," Bando said, according to The Journal. "He has a hard sinker, a slider and a change-up, and they're all strikes. He has a good head on his shoulders and keeps his cool in jams. I caught pitchers in the major leagues who had success and had less going for them than Chris." Johnson made AA El Paso for 1991. He also made the Brewers' 40-man roster. He went 4-4 with a 6.48 ERA before the Brewers, needing roster space, left him exposed to waivers. Montreal quickly claimed him and sent him to Harrisburg. "The Brewers took a calculated risk," Expos assistant general manager Dan Duquette told The Journal that August. "He had a good year in the California League last year but they obviously felt he wasn't pitching that well in the Texas League. "Chris Johnson is still a prospect," Duquette continued, adding Johnson was hit on the shoulder by a line-drive at El Paso. "He's been OK for us. We like him as a pitcher." Duquette also didn't commit to Johnson making AAA for 1992. 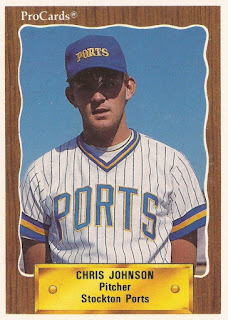 Johnson played at Harrisburg the full year in 1992, going 9-10 with a 3.98 ERA. By mid-1993, Johnson had moved on to the Cubs' system, at AA Orlando. He got in 15 games for Orlando that year with an ERA of 2.96. Johnson returned to AA Orlando for 1994 and 1995, the final two seasons of his affiliated career. Mainly a reliever toward the end, Johnson picked up seven saves his final two years with Orlando. One of those saves came in May 1994, pitching two scoreless innings, according to The Orlando Sentinel. Johnson also pitched three perfect innings of relief in a game that April, The Sentinel wrote. He played in one more season, with independent Newburgh and his career was over, never having made it higher than AA.